The European Maccabi Games, featuring more than 2,200 Jewish athletes from Europe and the United States, are held every four years in preparation for the international Maccabi Games, an Olympics-style event held in Israel, typically with about 9,000 Jewish competitors from around the world. 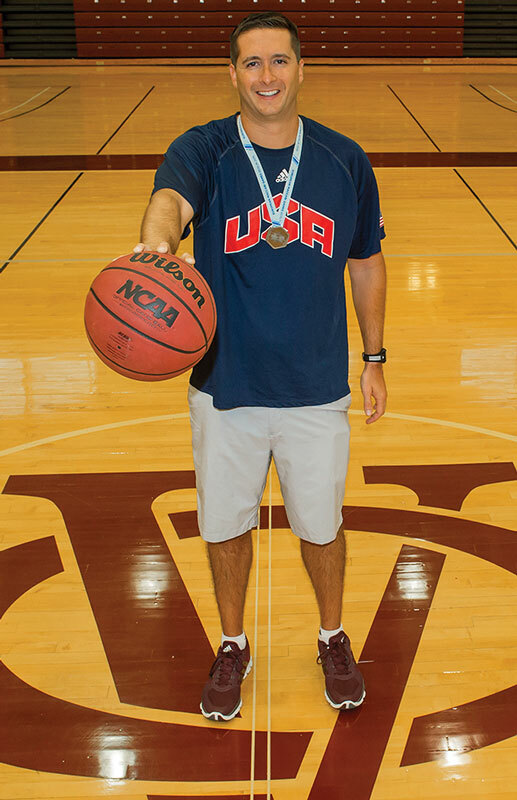 Vassar men’s basketball coach B.J. Dunne served as head coach of the USA team, which finished with a 4-1 record during the weeklong tournament, defeating all opponents in the preliminary round before falling to Russia in the finals on August 3. He and his assistant coach, Max Sass, of Wesleyan, selected the 12-player squad at the start of the summer and held practice sessions at Vassar’s Athletics and Fitness Center July 21 to 25 before departing for the games, held in Berlin. The talent level on the squad was equivalent to a mid- to upper-level NCAA Division I team, Dunne says, and two of the squads the USA faced—France and Russia—each had five professional players on their rosters. The Maccabi movement began in late 1895, when Jews, barred from sports clubs in Central and Eastern Europe, formed the first Jewish sports club—dubbed the Constantinople Maccabi Society—in Turkey. It was a model that would spread rapidly throughout Europe. Members faced threats of fascism during the Nazi era, when the clubs were banned and many of its leaders and members were arrested and sent to concentration camps. Some members who were studying in Allied countries when WWII began joined Allied armies to fight or joined in the resistance. Dunne says leading a squad of talented Jewish athletes in the international competition in Berlin had special meaning for him—both personally and professionally—and that meaning transcended wins and losses on the court. The 2015 European games were held in Berlin’s Olympic Park, where Adolf Hitler had watched the 1936 Summer Olympics, in which German Jews were banned from participating. Walking into the stadium was “an emotional experience,” Dunne says.